A bacterial infection better known for causing gum disease may be leading to the development of Alzheimer’s disease in some patients by entering the brain and releasing enzymes that attack important proteins. Scientists at the company Cortexyme, working with academics from around the world, say the findings of their study could lead to new treatment options for Alzheimer’s disease sufferers that work by targeting the bacterium Porphyromonas gingivalis, and they have developed a candidate drug that is currently undergoing clinical trials. ‘We investigated this particular pathogen because multiple prior studies had been published suggesting a link between P. gingivalis and Alzheimer’s disease,’ says Stephen Dominy, Cortexyme’s chief scientific officer. 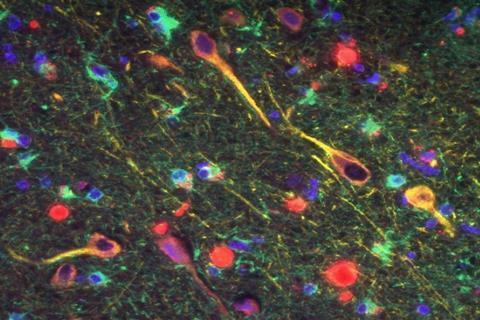 Recent research has suggested amyloid-beta – one of the proteins that forms aggregates in the brains of Alzheimer’s patients – is an antimicrobial peptide formed in response to bacterial infections in the brain, and P. gingivalis specifically has been found in the brains of people with Alzheimer’s. Cortexyme’s study looked at brain tissue from Alzheimer’s patients and found that more than 90% of samples contained gingipains, the harmful enzymes secreted by P. gingivalis, with levels significantly higher in sufferers’ brains than healthy ones. They detected the bacterium’s DNA in the cerebrospinal fluid of seven out of 10 living patients who had been diagnosed with Alzheimer’s disease. They also showed that when genetically modified mice who were predisposed to Alzheimer’s were infected with P. gingivalis, the bacterium ended up in their brain and that this was associated with increased levels of amyloid protein. Gingipains were also shown to cause damage to Tau, another brain protein thought to be involved in the development of Alzheimer’s. ‘Based on these findings, we believe that P. gingivalis is the main cause of Alzheimer’s disease, and the gingipains are the main drivers of Alzheimer’s pathology,’ Dominy says. P. gingivalis infections are typically dealt with using antibiotics, but Dominy and his colleagues found that treating infected cells with antibiotics didn’t stop the damage caused by the enzymes. Instead, they developed a small molecule that inhibits the gingipains themselves, which they showed could reduce neurodegeneration in mice injected with these enzymes. The treatment recently passed human safety studies and is due to enter Phase II/III clinical trials in mild to moderate Alzheimer’s patients this year. He says it is important to remember that the study was carried out by a company developing gingipain antagonists to treat dementia. ‘What this paper shows is their pre-clinical data – or at least the parts of it they want to show the world – that helps to strengthen their story,’ he says. He points out that while most of the data presented in the Cortexyme study supported their hypothesis, gingipains weren’t found in all of the Alzheimer’s-affected brains, ‘so whilst it may be a cause, the data don’t exactly support it being the only cause’. He adds that although we don’t yet know the extent to which it affects dementia risk, ‘maintaining good dental health is an important part of a healthy lifestyle’. Dominy agrees. ‘Certainly, reducing the P. gingivalis load in the mouth, especially at an early age, should be taken more seriously than it currently is based on our data,’ he says, though he adds that merely targeting gum disease is unlikely to help with infections of P. gingivalis in the brain. Alzheimer’s disease: have drug developers been on the wrong track?